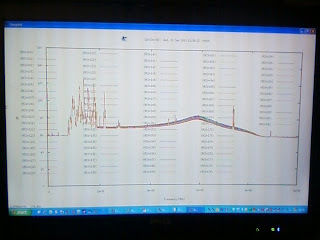 On 1st September 2010, at 11:38 UTC (12:38 local time), we measured the first signal from the completed LBA array at Chilbolton. These data are from all 192 channels (96 aerials, 2 polarisations each) and show the expected bandpasses from all elements functioning normally. Although not a sky image just yet, this is an important milestone in the development of the project. Thanks go to Menno Norden, Klaas Stuurwold, Henri Meulman and the local commissioning team for their work in getting to this point. However, this is also a moment for everyone involved in any way throughout the entire installation of the LBA. Without your contributions, this would have been impossible. Well done! Caption 1 : The first signal. 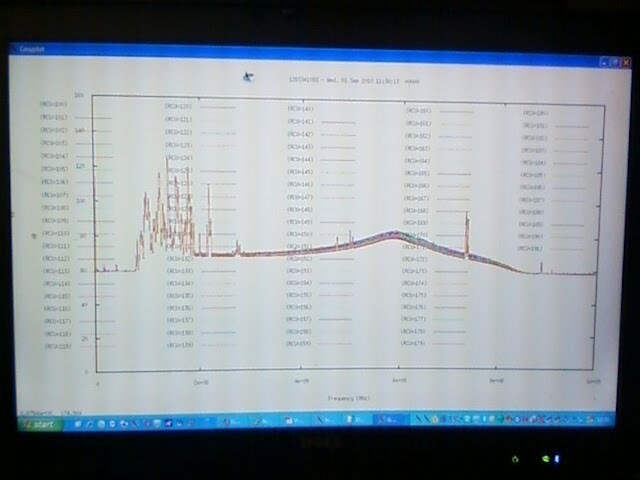 Although just a blurry photograph of a computer monitor, this is the first moment where radio signals have been correctly received, amplified, digitised and processed. Caption 2 : Some of the commissioning team. From left-to-right: Menno Norden, Klaas Stuurwold, Matthew Davies and Alejo Martinez-Sansigre.